Despite the wealth of art history and archaeology books out there, it’s rare to find something that is useful to the practitioner as well as the academic. Understandably, authors tend to have the ability or the desire to focus on one aspect. 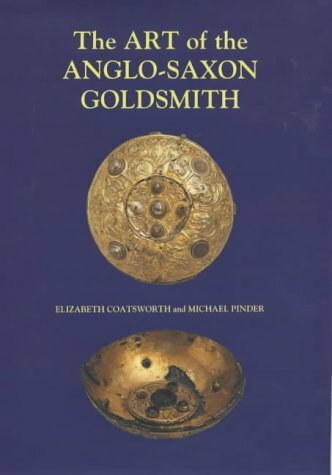 Coatworth and Pinder’s Art of the Anglo-Saxon Goldsmith is an exceptional study, combining both aspects seamlessly. The name is somewhat misleading, as the book covers work in gold, silver and copper; the same techniques can be applied to all of them. The ironwork of the ísensmiþ is not covered, but questions are raised about possible overlaps between ferrous and non-ferrous skills, and whether some of the metalworkers did both. There is no step-by-step guide to metalworking practice here, but the tools and methods of the period are described in section 2, in enough detail for the reader to develop their own workshop. This is a synthesis of archaeological finds and experimental archaeology, with some contributions by the authors. 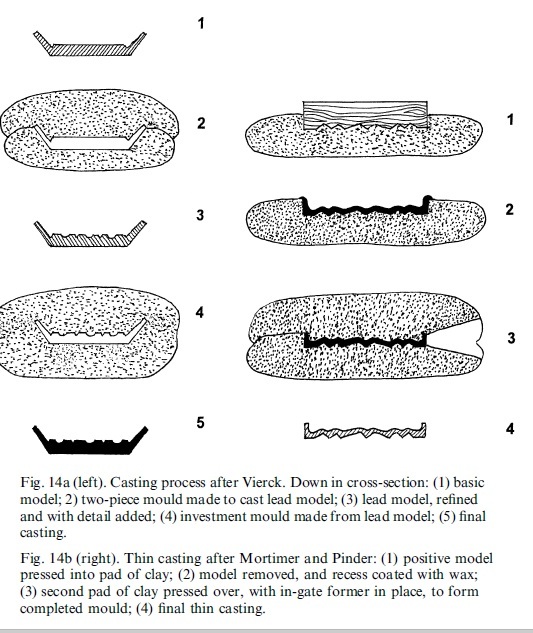 In particular, the manufacture of reeded strips is interesting, and there is a thorough discussion of mold-making, with surprisingly complex combinations of positive and negative models required for some cast objects. In section 3, extant texts (eg. legal documents, inscriptions, depictions) are used to reconstruct the role of the goldsmith in society, with an open-minded stance on issues like itinerant smiths versus settled workshops, and whether craft specialisation is suggestive of economic and social development. As the authors acknowledge, there is so little information, and the role of goldsmiths was far from simple – there were goldsmiths throughout Anglo-Saxon society, from slaves to the elites, but they are described indirectly, perhaps in a will (for the slaves) or a law, and there is nothing to link people with places and artefacts. The names of most will never be known, but they live on through their work. The appendices contain an Anglo-Saxon vocabulary for metalwork (with English and Latin translations), and a catalogue of 90 artefacts that are particularly relevant to the text. The bibliography is extensive – more evidence for the depth and insight of this study. There are more questions raised than questions answered in this book, but that is something to be praised. It provides a strong foundation for future research in this field, and I am very lucky to have a copy. Getting one yourself might be more problematic, as they cost over £100, but if you can, it is worth it.